The way back – or better forward – is only possible if we invest in peaceful coexistence in a multidimensional approach, if we analyze the root causes of war and violence, combat social and economic injustice, weapons, geostrategic power interests and revitalize the UN in the spirit of its charter. This is why we participate actively at the Munich Peace conference in parallel to the annual MSC! But this is not the logic of the Munich Security Conference / MSC, although headlines about this year’s MSC demand a rethinking: „World close to the abyss“, „The West without political strategies“, „Escalation rhetoric instead of Dialogue“, „Threatening international insecurity“. From our point of view as Peacewomen, a total failure, because an end to the spiral of violence shimmered only in side events and was present only at the peace conference of civil society. „The winter is here“ – headlined the mirror, and the snowdrift illustrated this especially for the demonstrators on the street. The MSC is the traditional meeting place of economic, political and military power elites and a media-effective propaganda forum to justify NATO, its billions of military spending and its illegal war missions sold to the population as „humanitarian interventions“. In 2018 „the alarm lights will turn red,“ Ambassador Wolfgang Ischinger said in his opening speech – but the word “Peace” is missing as a strategic option, even as a vision: cyber attacks, terrorism, open threats, weapons of mass destruction, mistrust, aggressive rhetoric (e.g. Netanyahu against Iran), irreconcilability, tactics and exclusion – that rushed through the plenary debates and were omnipresent in the background discussions. Talking about armament is the order of the day – the 2% goal of the BIP for NATO, the „community of values“ how they still call it, is „made clear“ and only topped with the instrumentalization of the UN as an intervention force. Under the title of „European Unification“, the „Permanent Structured Cooperation“ / PESCO is celebrated. „We want to remain transatlantic, but European,“ said the Defense Ministers Ursula von der Leyen in accordance with her counterpart Florence Parly from France in the opening session. In the subsequent European Defense Roundtable, they praised „the operational cooperation between France and Germany“, such as stabilization mission in Mali and armaments and procurement projects. President of the EU Commission Juncker called it „emancipation of EU” (just against Trump? – anyway not well received by the Austrian Chancellor and the Polish Prime Minister present). Two years ago, the process of „new (German) responsibility“ in Munich proclaimed by the unanimous appeal of Gauck (President), Steinmeier (Foreign Minister) and von der Leyen (Defence Minister) for strengthening the capacity to intervene – militarily of course declared „last resort“. Now – beyond civic-military cooperation, development politics are openly instrumentalised for “security measures” and European defense is not border management anymore (already misused!) but globalized military wise. This is not new for us who criticize weapons export (in crisis and war regions) since ever! 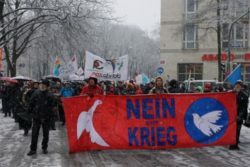 According to the new coalition agreement in Germany, substantial additional budgetary funds will be given priority in two areas: the defense sector and the development policy – you see the connection? The core theme of ‚military security‘, according to Ischinger, is linked to the specific expectations of the conference guests, but covers also the profit interests of corporations, banks and the defense industry, whose representatives accounted for about one third of the invited participants. He added comfortingly to the group „MSC change“: arms’ reduction was delegated to an OSCE expert group – whose report one had to wait for. This is an „insecurity conference!“ pointed out Jürgen Grässlin in the demonstration against MSC, and who knows better than him: The figures for the rise of arms exports worldwide and especially from Munich, „the capital of German arms exports“, are a breach of the arms exports directives, deliveries to warlords, support human rights violations, murder included: „profiteers of wars are have to go to jail!“. In conclusion, MSC formats have become more versatile. Ischinger promises a slow process of opening up through the participation of „well known“ NGOs, Amnesty International, Human Rights Watch, Greenpeace, this year Misereor and Forum ZFD on „Priority for Civil Peacebuilding“. Beatrice Fihn, invited as a representative of the Nobel Peace Prize for ICAN, spoke against the deterrence with nuclear weapons and appealed to negotiate the ban treaty – but only after the hall of „important“ decision makers was almost empty. The alternative International Forum, which meets prominently every year in the Old Town Hall on the topic of „Peace and Justice“, will have to continue for a long time to present alternatives: Nela from “women organizing for a change“, working with WILPF in Bosnia made it crystal clear that sustainable peace only can be realized through the creation of economic, political and social structures and Women’s Participation in the Peace Processes: “By ignoring the civilian voices, and in particular women’s voices, who took the lead on peace building even in the midst of war, serious omission were made in our peace agreement and considering the extent of the interventions the reform agenda introduces, it is going to make critical influences on how social justice and gender equality in this country play out in the future – both things that are absolutely detrimental for sustainability of the peace”. Nela referred to similar warning approaches taking place in other parts of the world, as we speak – Ukraine, Syria, Palestine, Iraq.“ Her intervention was followed by Tiffany Easthom from “Nonviolent Peace force/NVPF” on the effects and commitments of Peace “trainers”. The interventions were highly applauded by the “insider” public. 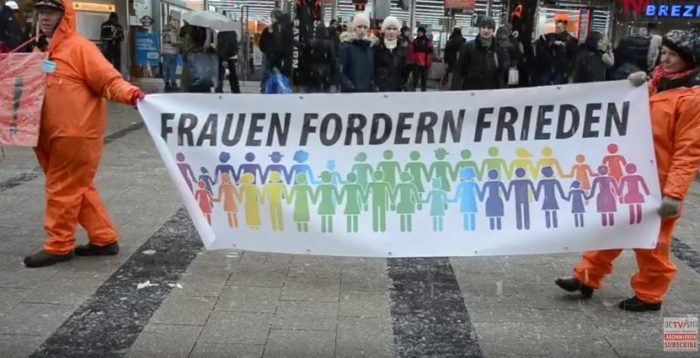 Article written by Heidi Meinzolt on March 8 – International women’s day! Official motto of the Munich Security Conference/MSC – rather cynical!